Hi! Here's my take on this week's Purple Bike Challenge at CCNS. I don't think I would have ever tried making a bike purple until this challenge but I'm pleased with how this card turned out. I first used the Memory Box Brand New Bicycle on a lavender foil sheet from Spellbinders Jewel Tones foil pack. When cutting out these foil sheets and the die is intricate, I first glue the sheet down to white card stock. I find that this gives the foil more weight and is less likely to bend or wrinkle when removing from the die. I also die cut 7 balloons from a light purple card stock using the balloon die from ODBD Happy Birthday set. To add dimension to the balloons, I sponged Shaded Lilac around the edges of the balloons and added a bit of white with a white gel pen. To make my background, I used the large stitched rectangle die from MFT Blueprint 13 and sponged Broken China over masked clouds to create my sky scene. Before adhering the balloons and after the gluing the bike down, I used a ruler and a black Micron Pen to draw 7 lines up from the bike. The balloons were glued on and the last two were popped up with small Joy! foam pads. The sentiment is from Mama Elephant Up and Away stamped in black pigment ink and clear embossed. Thank you so much for looking and hope you can play along. 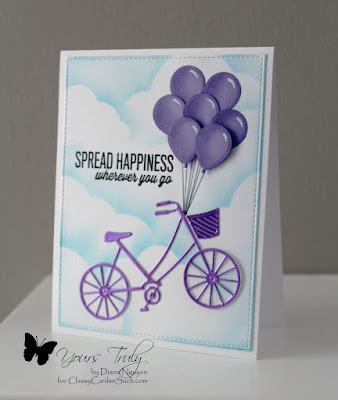 I would love to see your take on this week's Purple Ride challenge at Classy Cards 'n Such!